Yes those are the same horizontal lines I'm seeing. I don't see them on static 'no-motion' screens, but in my case, I do see them when there's horizontal scrolling or motion like in Rescue Raiders or Wings of Fury. They are present during both game-play and the intros. So will they eventually go away when the machine warms up a little? Yes, it's hacky but it works. 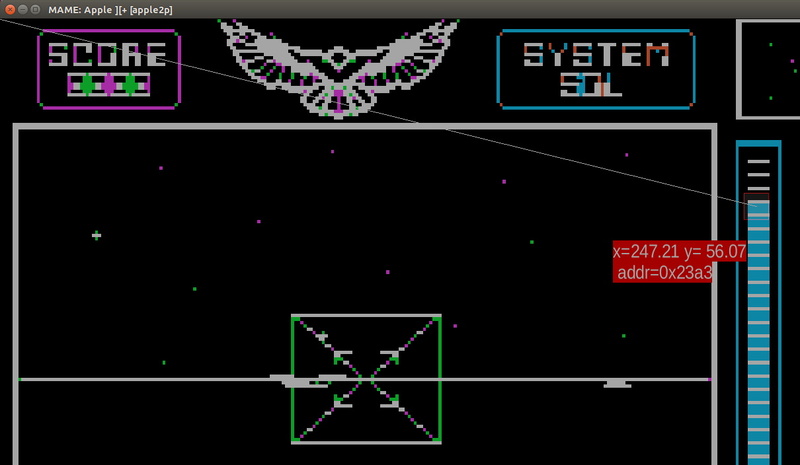 I'm having a blast beating Stellar 7 again, this time with the Atari Joystick. I had a question regarding how MAME chooses the floppy format. I am using the apple3 emulation and trying to load a Prodos ordered disk image, but having issues. The disk is a modified atomic-defense disk but now in po format, so its not a prodos/sos disk as such. Does MAME used the file extension or does it detect the sector ordering some other way? Is there a way to force using po ordering? 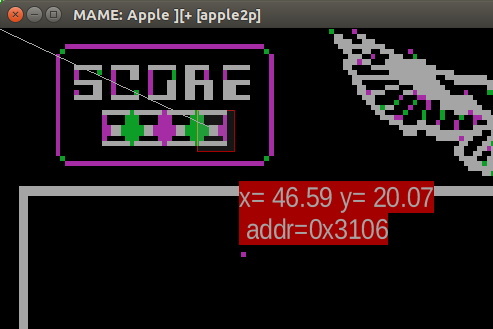 The MAME code the Apple .DSK formats supports both sector orders, but the algorithm it uses to identify images in this case doesn't look at sector orders. It seems that only a file having the .po extension will be detected as ProDOS format. Depends on the disk controller. wozfdc attempts to algorithmically identify the sector order by matching known boot sectors, and that's what the apple3 driver uses. On apple2/2p/2e the same applies. On the IIgs, and on earlier IIs if you use "-sl6 diskii", it does use the file extension to determine the sector order. robj: is that disc image available someplace? I can add it to the heuristics. I wanted to be able to click on the apple graphics screen and find out the x,y coordinates and the memory location. It got tiring to save a screenshot, then load into gimp to figure out what the coordinates were. So why not have mame help me out. If I execute this routine, it will give me the coordinates, draw a line and a box around it where I click on the screen. Once I know the address then I can just set a watchpoint in the debugger. which allowed me to set a watchpoint "wp 3106,1,w" and then once it hit that, do a "history" which led me to a routine around 7E46 and disassembling at 7E00 points me to the memory addresses at 81F8 to 81FA where the player score is stored. A couple of notes, if you have the debugger paused, it won't work because the emu.wait() won't get fired. If the target is nil, just click on a couple of windows and try it again. And you have to emu.unpause() to get everything moving again. Last edited by Golden Child; 01/30/19 07:32 PM. You want to cheat in Stellar 7? That's a cool script. Normally, I just set individual watch-points on the screen lines ($2000-2027, $2400-2427, $2800-2827, etc) to know when things are hit. I don't think that I've needed pixel-level breakpoints so far. That's a very cool script! I don't really want to cheat so much as fully understand the code. Cheating in Stellar 7 would totally spoil the whole experience. 8-) I like the sense of panic when your shield is running out, and then you've got to go into stealth mode. I've got a project where I want to completely disassemble Stellar 7's code and figure out what everything does. I'd like to try and rewrite it with better graphics, but playing exactly like the original. It's such a work of art that I'm amazed to this day that such a great game could be done on the Apple 2. If you like that one, here's a "better version" that gets called by emu.register_frame_done() so it runs after every frame as an overlay. If you press the button, it will clear the dispatcher and won't draw the target anymore. If it goes runaway, you can type "clrd()" and hit return to stop the function calls. Last edited by Golden Child; 01/31/19 03:17 AM.